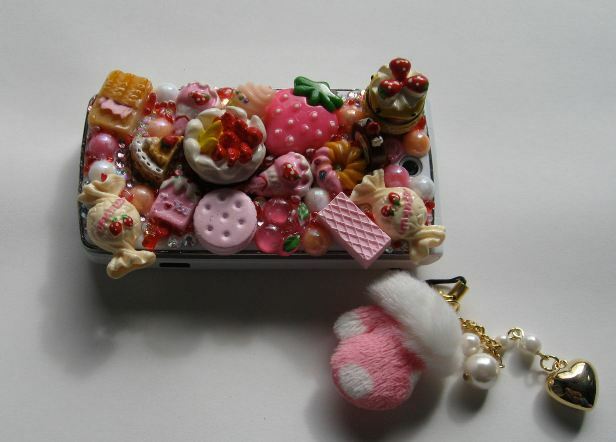 For years now Japanese women have been decorating their cell phones. In fact, it is so common that the term “dekokeitai” emerged (combination of the terms “decoration”and “keitai”, which is Japanese for mobile phone). The accessory industry around the dekokeitai is huge in Japan, ranging from all sorts of key chains to glitter, miniature pets, jewels and other decorational items. It was a way to customize and individualize the cell phones and make it girlier according to the individual preference. And Japanese women love all things “kawaii” or “cute”, and want to be surrounded by them. The rise of the iPhone and other high tech smartphones has been a dilemma to them. The flat, rational, perfect exterior of these smartphones is not as easily alterable as had been the case with the old Japanese cell phones. Women can not even attach a keychain – where would they attach it to? The result is an overwhelmingly large amount of smartphone jackets. But despite that huge assortment, it is not the same as decorating your own cell phone. It’s just attaching one finished product to another finished product. It’s like a creative potential just vanished by designer’s belief that their finished product was perfection. As much as product designers might certainly cringe at the thought of their product being cluttered by uber-kawaiiness, the truth is that few Japanese women will replace their beloved dekokeitai if they can possibly avoid it. Morinosuke Kawaguchi argues that products with an appealing mission to end consumers should not be finished when they hit the stores. Love for the product, and loyalty to a product, lies in your personal touches and interaction with it. According to him, the winner in business will be the one who designs the system, but that does not apply the final touches to the product. While true profitability lies in the system, user-finishable is just the natural consquence of customization.